The 2019 International Education Expo Hall is over 90% Sold! Click the Purchase a Booth button on the right for more information. The NAFSA Annual Conference & Expo is the largest and most dynamic international education event in the world. Bringing in nearly 10,000 professionals from over 110 countries, NAFSA Expo Hall highlights the diverse and innovative programs, products, and services advancing the future of international education and exchange. 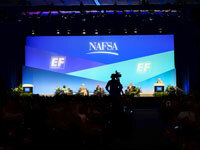 In 2018, NAFSA brought together more than 350 exhibitors representing every aspect of international education including academic institutions, consulting firms, pathway providers, insurance companies, third-party providers, and much more. 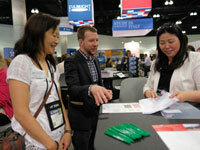 NAFSA’s Expo Hall brings in more than 50 international country consortia representing hundreds of global academic institutions from both developed and emerging markets. It is the best place for international higher education administrators to meet with existing partners from around the world all in one place. Booth sales for the 2019 NAFSA Annual Conference & Expo are now open. Click on the For Exhibitors link below to see booth pricing, the 2019 Expo Hall floor plan, sales timeline, and access the online rental system. Discover how you can showcase your services at NAFSA 2019. Make the most of your time at the NAFSA Annual Conference. Explore the variety of advertising and marketing opportunities.